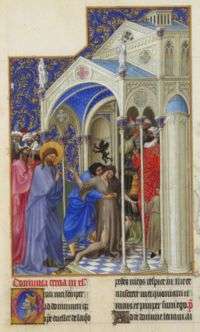 Exorcising a boy possessed by a demon from Très Riches Heures du Duc de Berry, 15th century. Exorcising a boy possessed by a demon is one of the miracles attributed to Jesus in the synoptic Gospels, involving the healing of a demonically possessed boy through exorcism. It appears first in the Gospel of Mark and is repeated, slightly changed in the Gospel of Matthew and the Gospel of Luke. In the Gospel narrative, this takes place following the Transfiguration. The Gospel of Mark account describes how Jesus is surrounded by a crowd, one of whom asks for help for his son, who 'has a spirit that makes him unable to speak'. He explains that the spirit makes him foam at the mouth, grind his teeth, and become rigid. He tells Jesus that he had asked the disciples to cure the boy, but they had been unable to do so. Jesus responds by describing his followers as a 'faithless generation', and asks 'how much longer must I be among you?'. When he is brought to Jesus, the boy immediately experiences convulsions. Jesus asks the father how long this has affected the child; the father replies that this had been since his childhood and asks Jesus to help if he can. Jesus tells him that everything is possible to one who believes, and the man responds, 'I believe; help my unbelief!'. Jesus then commands the spirit to leave the boy, and it does. Seeing that he looks like a corpse, many in the crowd think he is dead, but Jesus helps him to his feet. The Gospel of Matthew version is considerably shorter, and drops the reference to a crowd and (in most versions) the need for prayer. It also specifies that the boy is suffering from seizures. The Gospel of Luke version is also shortened, but mention of the crowd is retained. Wikimedia Commons has media related to Healing of the demon-possessed.